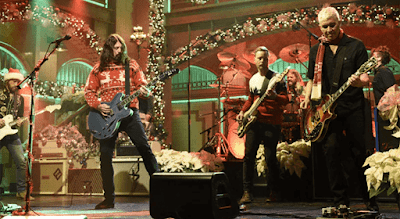 The Foo Fighters performed a pair of tracks on NBC-TV’s Saturday Night Live on December 16, and video from the program is streaming online. On hand to promote their latest album, “Concrete And Gold”, the band was joined by three female backup singers to deliver their current single, “The Sky Is A Neighborhood”, early in the episode hosted by comedian Kevin Hart. The Foo Fighters returned to close out the show with their 1997 classic, “Everlong”, which began with a quiet start by Dave Grohl before the group kicked into a Christmas-themed medley led by the singers that featured Darlene Love's "Christmas (Baby Please Come Home)" and the “A Charlie Brown Christmas” theme, "Linus & Lucy." The band are currently winding down their 2017 live dates in support of their ninth album, which debuted at No. 1 on the Billboard 200 earlier this year. The Foo Fighters will close out 2017 with a sold-out New Year’s Eve date at The Chelsea at The Cosmopolitan in Las Vegas, NV on December 31. The group will begin 2018 with dates in Australia and New Zealand in January before shows in in South America and a return to North American stages in April. The Foo Fighters were named the No. 9 Rock News Artist Of The Year and delivered the No. 7 Rock News Story Of The Year as part of the 2017 hennemusic Rock News Awards.